Cycling to work is the ultimate return to childhood’s happy days. And it saves on gas and vehicle wear and tear while promoting fresh air and the carefree exhilaration you enjoyed back in the day when your bike could take you anywhere. Many municipalities are encouraging resident to pedal around town versus driving by welcoming bike-sharing programs. 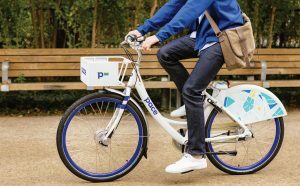 Companies like Zagster, LimeBike and Social Bike, for example, have been cropping up in cityscapes and are doing very well with their bikes and docking stations. Bike-sharing is so popular that cities would do well to have a plan for vandalism and theft. According to Parks & Recreation Director Chris Jenkins of Hastings, Minn., his city’s bike-sharing program has been in operation since late June of 2015 and, to the best of his knowledge, hasn’t experienced any outright theft. The annual fee paid by users of the Zagster program covers the cost of all repairs and replacement if necessary. When an issue is reported, Zagster pulls that bike out of service and its contract manager resolves the issue and puts the bike back into service. Issues are typically reported directly to Zagster over the phone, though occasionally some are reported to city staff. On a few occasions, bikes have been found unsecured, and those have been brought to the shop until the mechanic can get to them if repairs are needed; if that is not needed, they can simply be returned. If one had parked the bike-share bicycle outside a library, for instance, and returned to find the bike fenders smashed and paint strewn liberally over it, what would be the procedure for restoring it? Jenkins noted that other incidents could come from stolen bike seats, stolen bike front racks or bikes having been ridden too hard or used in a manner for which they aren’t intended, such as a young adult abusing a bike because it wasn’t personally owned. 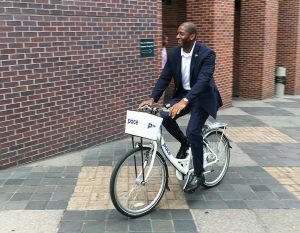 For approximately five years, Charlotte, N.C., has been using B-cycle for its bike-sharing program, according to program Executive Director Dianna Ward, who noted that her city has had zero thefts and almost minimal vandalism. “Occasionally we have someone slash a tire,” said Ward, adding that this happens maybe once or twice per year. Kelly Goldthorpe is the director of marketing and rider experience at Motivate, the operator of Divvy Bicycle System, which is Chicago’s bike-share system. 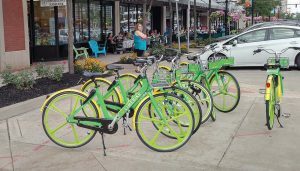 South Bend, Ind., has also added a bike-share service for its residents since last July, according to Chris Dressel, AICP, planner and bicycle coordinator. 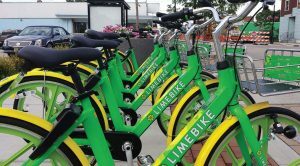 “The city of South Bend has entered an agreement with LimeBike, and they are the owner and operator of the city’s dockless bikeshare system,” said Dressel. He added, “The bikes all look the same for the most part, but the branding is tailored to each city to add local character. So for each program — Pace Tallahassee, Pace Albuquerque and so on — there are long and short banners to incorporate the name and color scheme of each city. Zagster/Pace is the only bike-share company currently offering adaptive bicycles seamlessly integrated into its broader bike-share networks. It features six forms of adaptive bikes: heavy-duty cruiser, trike, cargo trike, side-by-side tandem, recumbent and hand cycle. “Regarding theft and vandalism, Pace features a two-point security system to ensure bikes lock to fixed objects — not just to themselves — to mitigate theft and abuse and preserve public right-of-way,” Terbush said. Another thing Terbush noted was that in addition to the locking tech, Pace also features high-quality bikes and are a proprietary design built off the Breezer Uptown, a multi-time winner of Bicycling Magazine’s “Editor’s Choice” Award for best commuter bike. Likely, more cities will be joining the movement, and with bike-sharing services handling the bulk of operations and maintenance, it can be a fun added service for residents without overwhelming city staff with one more task.